Super Socks5Cap = sockscap + socks finder + socks checker, is a program that allows network applications that do not support working through proxy servers to operate through a HTTPS or SOCKS4/SOCKS5 proxy server and Super Network Tunnel Client/Server proxy ( Super Network Tunnel Proxy is a full function type proxy, can support pure http proxy ( not support https) and support NTLM identification, and can connect any destination port bypass firewall ) . With Super Socks5Cap you can work with any Internet client (browsers, ftp, P2P, ICQ, IRC, eMule, telnet, ssh, video/audio, games...) through a network that is separated from the Internet by a firewall (only one open port is required). Super Socks5Cap will provide you with added privacy in all your Internet activities. An example is sending and receiving email through a proxy server or by chaining multiple proxy servers together. Super Socks5Cap supports all mail clients while allowing you to remain anonymous. 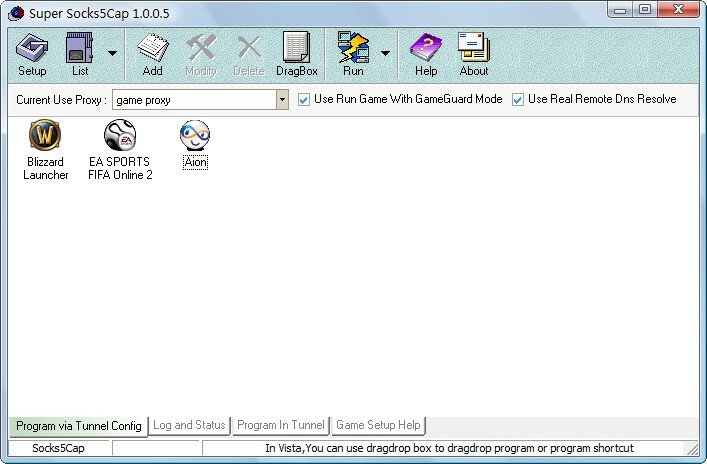 Like 'sockscap', can tunnel TCP/UDP connection , but it support vista and windows7/X64. Work with super network tunnel , can easy bypass pure http proxy, and connect to any destination port. Embed proxy finder and proxy checker function, can automatically search proxy and pick up thousands of free socks proxy every day. Use five types of proxy servers: SOCKS v4, SOCKS v5, HTTPS, Super Network Tunnel Client Proxy, Super Network Tunnel Server Proxy and SSH tunnel proxy. &quot;Tunnel&quot; the entire system (force all network connections in the system work through a proxy server). Resolve DNS names through a proxy server (fake mode) and also support real remote DNS resolve (some game need run this mode). Support fake client local IP address same as server IP address to play some game. GeoBlock 1.05 by Tometa Software, Inc.